Mortal Kombat: Deception is a fighting game developed and published by Midway as the sixth installment for the Mortal Kombat (MK) series. 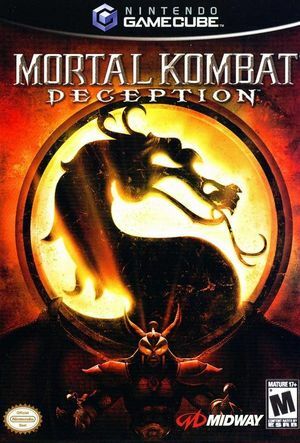 Mortal Kombat: Deception follows the storyline from the fifth installment, Mortal Kombat: Deadly Alliance. The story centers on the revival of the Dragon King Onaga, who attempts to conquer the realms featured in the series after defeating the sorcerers Quan Chi and Shang Tsung, the main antagonists in the previous game, and the Thunder God Raiden, defender from Earthrealm. As such, the surviving warriors from the previous titles join forces to confront Onaga. The player's shadow has small rectangles surrounding it when using IR>1x. To prevent that, turn off Scaled EFB Copies or set "Internal Resolution" to Native. The graph below charts the compatibility with Mortal Kombat: Deception since Dolphin's 2.0 release, listing revisions only where a compatibility change occurred. This page was last edited on 15 October 2018, at 05:52.